2. If you divide their net worths by their age, Carlos Slim and Bill Gates have each accumulated more than $100,000 in net worth for every hour they've been alive. 3. According to Forbes, if a Google employee passes away, "their surviving spouse or domestic partner will receive a check for 50% of their salary every year for the next decade." 4. According to the Deutsche Bank Long-Term Asset Return Study, the last time interest rates were near current levels, in the 1950s, Treasury bonds lost 40% of their inflation-adjusted value over the following three decades. 6. There are 3.8 million fewer Americans aged 30 to 44 today than there were a decade ago. 7. Related: The population of Americans aged 30 to 44 is about to start increasing for the first time since 2000. 8. Since 1928, the Dow Jones has increased more than 10% in a single day eight times, declined more than 10% in a single day four times, and gone either up or down more than 5% in a single day 136 times. 9. "U.S. oil production grew more in 2012 than in any year in the history of the domestic industry, which began in 1859," writes Tom Fowler of The Wall Street Journal. 10. "Last year, for the first time, spending by Apple and Google on patent lawsuits and unusually big-dollar patent purchases exceeded spending on research and development of new products," writes The New York Times. -- Who Owns Our National Debt? 11. Start with a dollar. Double it every day. In 48 days you'll own every financial asset that exists on the planet — about $200 trillion. 12. There were fewer state and local education jobs in 2012 than there were in 2005, even though the number of 5- to 18-year-olds has increased by 600,000. 13. Adjusting for inflation, Warren Buffett was a millionaire by age 25. 14. Including dividends, the S&P 500 gained 135% from March 2009 through January 2013, during what people remember as the "Great Recession." It gained the exact same amount from 1996 to 2000, during what people remember as the "greatest bull market in history." 15. "97% of the world's population now lives in countries where the fertility rate is falling," writes author Jonathan Last. 16. The U.K. economy is 3.3% smaller than it was in 2008. The U.S. economy is 2.9% larger (both adjusted for inflation). 17. In 1980, there were 15,099 Americans aged 100 years or more. By 1990, there were 36,486, and by 2012 there were 88,510, according to the Census Bureau. 18. Dell "has spent more money on share repurchases than it earned throughout its life as a public company," writes Floyd Norris of The New York Times. 19. From 2006 to 2011, Hewlett-Packard spent $51 billion on share repurchases at an average price of $40.80 per share. Shares currently trade at $16.50. 20. The International Labour Organization estimates a record 200 million people will be unemployed around the world in 2013. If you gave them their own country, it would be the fifth-largest in the world. 22. According to The Telegraph, "Four in 10 girls born today is expected to live to 100. ... If trends continue, the majority of girls born in 2060 — some 60 per cent — will live to see 2160." 23. Apple's cash and investments are now equal to the GDP of Hungary and more than those of Vietnam and Iraq. 25. In December, a start-up called Contrail Systems was purchased for $176 million two days after it launched. 26. U.S. charitable giving was $298 billion in 2011, according to the Giving USA Foundation. That's more than the GDP of all but 33 countries in the world. 27. According to Bloomberg, "The 50 stocks in the S&P 500 with the lowest analyst ratings at the end of 2011 posted an average return of 23 percent [in 2012], outperforming the index by 7 percentage points." 28. "Globally, the production of a given quantity of crop requires 65% less land than it did in 1961," writes author Matt Ridley. 29. Thanks in large part to cellphone cameras, "Ten percent of all of the photographs made in the entire history of photography were made last year," according to Time. 30. Internal emails caught a team of Morgan Stanley employees sarcastically naming a subprime CDO in 2007. "Nuclear Holocaust," "Mike Tyson's Punchout," "Hitman," "Meltdown," and "S***bag" were all considered. 31. 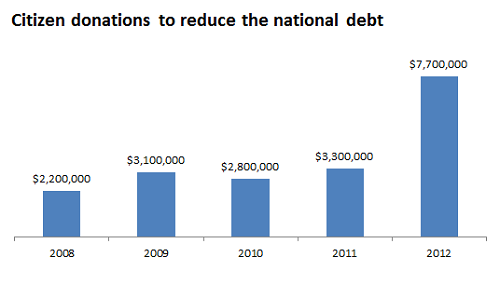 Since 2008, Americans have donated $19.1 million to the U.S. Treasury to help pay down the national debt. 32. Fortune magazine published an article titled "10 Stocks To Last the Decade" in August, 2000. By December 2012, the portfolio had lost 74.3% of its value, according to analyst Barry Ritholtz. 33. From 2005 to 2012, total student loans outstanding increased by $539 billion, according to the Federal Reserve. 35. The 100 largest public pension funds alone have $1.2 trillion of unfunded liabilities, according to actuarial firm Milliman. 36. According to a study by four economists from Cornell, Carnegie Mellon, and Vanguard, "the number of investors who check their accounts drops by 8.7% following a market decline compared to a market increase." 37. The average new American home was 1,535 square feet in 1975 and 2,169 square feet in 2010, according to the Census Bureau. 38. Cambridge Associates estimates that 3% of venture capital firms generate 95% of the industry's returns. It adds that there is little change in the composition of those 3% of firms over time. 39. Growth in America's energy output since 2008 has surpassed that of any other country in the world, according to energy analyst Daniel Yergin. 40. Two news headlines published on the same day last September summed up the U.S. economy perfectly: "U.S. Median Income Lowest Since 1995, " and "Ferrari sales surge to record highs." 41. According to ConvergEx Group, "Only 58% of us are even saving for retirement in the first place. Of that group, 60% have less than $25,000 put away. ... A full 30% have less than $1,000." 42. 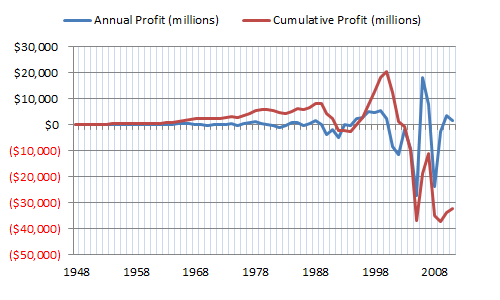 If you add up annual profits of the entire airline industry going back to 1948, you get -$32 billion. 43. Since 1928, the S&P 500 has closed at a new all-time high 1,024 times, or 4.8% of all trading days. 44. According to California Common Sense, "Over the last 30 years, the number of people California incarcerates grew more than eight times faster than the general population." 45. One in seven crimes committed in New York City now involves an Apple product being stolen, according to NYPD records cited by ABC News. 46. In the first quarter of 2012, the number of iPhones Apple sold per day surpassed the number of babies born per day worldwide (402,000 vs. 300,000), according to Mobile First. 47. On Dec. 5, 2012, Apple stock lost $34.9 billion in market cap. According to CNBC's Carl Quintanilla, 417 of the S&P 500's components had a total market cap of less than $35 billion that day. 48. According to economist Glen Weyl, "Of Harvard students graduating in early '90s and pursuing careers in finance, 1/3 were making over $1 million a year by 2005." 50. According to The Economist, "By 2030, 22% of people in the OECD club of rich countries will be 65 or older, nearly double the share in 1990." 51. According to a study by two Yale economists, if state and local governments acted like they had in the last five recessions, they would have added at least 1.4 million jobs since 2007. Instead, they cut more than 700,000. 52. The number of workers aged 55 and up is about to surpass the number of workers aged 24 to 34 for the first time ever. 53. In 2011, Asia had more millionaires than North America for the first time ever, according to RBC Wealth Management. 54. According to Enerdata, the U.S. consumed less total energy in 2011 than it did in 2000. 55. The IRS estimates that illegal tax-evasion reduced government tax revenue by $450 billion in 2006 (the most recent year calculated). That's roughly equal to what the government spends annually on Medicare. 56. According to The Wall Street Journal, "The average monthly mortgage payment on a median-price home in October, assuming a 10% down payment, fell to $720 at prevailing rates, down from nearly $1,270 at the end of 2005." 58. "Household debt is now 163.4% of disposable income in Canada, close to the U.S. level at the height of the subprime crisis," writes The Wall Street Journal. 59. In 2012, the Greek stock market (ATHEX Index) outperformed the Chinese stock market (Shanghai Composite) by 48 percentage points. 60. The International Energy Agency predicts that the U.S. will become the world's largest oil-producer by 2020, overtaking Saudi Arabia. 62. According to BetterInvesting, the number of investment clubs has declined by 90% since 1998 from 400,000 to 39,000. 63. Public filings show that Federal Reserve Chairman Ben Bernanke has owned stock in just one individual company over the last decade: Altria Group (which he sold in 2004). 64. Renaissance Technologies, a hedge fund run by James Simons, has allegedly produced average returns of 80% a year since 1988 (before fees), according to Bloomberg. That would turn $1,000 into $2.4 billion in 25 years. 65. The S&P 500 has returned about 9% a year over the long run, but few years see returns even close to that. Since 1871, the index has risen or fallen more than 20% in one out of every three years. Less than one out of every five years sees a gain of between 1% and 9%. 66. Since U.S. markets bottomed in March 2009, more than $8 trillion of lost wealth has been recouped. 67. During the Federal Reserve's June 2007 policy meeting, the word "recession" was used three times; the word "strong" was used 61 times. The economy entered recession six months later. 68. Last year, Franklin Templeton asked 1,000 investors whether the S&P 500 went up or down in 2009 and 2010. Sixty-six percent thought it went down in 2009, while 48% said it declined in 2010. In reality, the index gained 26.5% in 2009 and 15.1% in 2010. 69. The share of an average U.S. household budget going toward gas in 2012 was nearly 4%, tying for the highest level in almost three decades, according to Energy Information Administration figures cited by The Guardian. 70. "Of the Americans who earn over $150,000, 82 percent had a bachelor's degree. Just 6.5 percent had no more than a high school diploma," writes Catherine Rampell of The New York Times. 71. According to a survey by Paola Sapienza and Luigi Zingales, effectively all economists agreed that stock prices are hard to predict. Only 59% of average Americans felt the same way. 72. According to the IMF, if Japan's female labor-participation rate rose to levels of Northern Europe, its per-capita GDP could be permanently increased by 8%. 73. Credit card debt as a percentage of GDP is now at the lowest level in two decades. 74. The Energy Information Administration predicts that U.S. oil imports will fall to 6 million barrels a day next year — their lowest level in 25 years. 75. According to economist Stephen Bronars, the new 39.6% federal tax bracket will only affect 0.7% of taxpayers but will hit 9.5% of aggregate personal income, as top earners earn a disproportionate share of the national income. 76. From 2001 to 2007, new-home construction outpaced household formation by more than 3 million homes. 77. According to Gallup, 51.3% of Americans consider themselves "thriving," 45.1% say they are "struggling," and 3.6% say they're "suffering." 78. An average couple will pay $155,000 in in 401(k) fees over their careers, according to Demos, reducing an average account balance from $510,000 to $355,000. 79. Related: 84% of actively managed U.S. stock funds underperformed the S&P 500 in 2011. 80. According to The Wall Street Journal, 49.1% of Americans live in a household "where at least one member received some type of government benefit in the first quarter of 2011." 81. According to New York Times writer Binyamin Appelbaum: "Average months between US recessions since 1854: 42. Months since last recession: 42." 82. With bond yields near all-time lows, Richard Barley of The Wall Street Journal writes, "For a one-percentage point rise in yields, 10-year U.S. Treasury holders now face a drop in price of nearly nine percentage points." 83. "By 2050, workers' median age in China and Japan will be about 50, a decade higher than in America," writes Robert Samuelson. 84. Of the 3.1 million students who graduated high school in 2010, 78.2% received their diplomas on time, according to the National Center for Education Statistics. That was the highest percentage since 1974. 86. According to Wired magazine, "In a 2006 survey, 30 percent of people without a high school degree said that playing the lottery was a wealth-building strategy. ... On average, households that make less than $12,400 a year spend 5 percent of their income on lotteries." 87. According to David Wessel of The Wall Street Journal, Americans "spend about half of their food budgets at restaurants now, compared to a third in the 1970s." 88. We are used to hearing how much faster the earnings of the top 1% grow compared with everyone else's, but we often forget that it used to be the other way around. From 1943 to 1980, the annual incomes of the bottom 90% of Americans doubled in real terms, while the average income of the top 1% grew just 23%, according to Robert Frank. 89. According to Vanguard founder John Bogle, the average equity mutual fund gained 173% from 1997 to 2011, but the average equity mutual fund investor earned only 110%, thanks to the tendency to buy high and sell low. 90. According to David Leonhardt, median family incomes have fallen substantially over a decade for the first time since the Great Depression. "By , family income was 8 percent lower than it had been 11 years earlier, at its peak in 2000." 91. The rise in domestic energy-production has already shaved $175 billion off our annual import bill compared with five years ago, according to energy analyst Daniel Yergin. 92. Federal nondefense discretionary spending — all spending minus defense and entitlements — is on track to hit its lowest level as a share of GDP in more than 50 years, according to data from the Congressional Budget Office. 93. Bonds have become so richly valued that UBS is reportedly reclassifying brokerage clients who are overweight bonds as "aggressive" investors — most likely to avoid future lawsuits if and when bonds lose value. 94. According to The Economist, "Over the past ten years, hedge-fund managers have underperformed not just the stock market, but inflation as well." 95. According to Bloomberg, "Americans have missed out on almost $200 billion of stock gains as they drained money from the market in the past four years, haunted by the financial crisis. 96. In the 1960s, wages and salary income made up more than 50% of GDP. By 2011, it was less than 44%, as dividends, interest, and capital gains made up a growing share of the nation's income. 97. S&P 500 companies held $900 billion in cash at the end of June, according to Thomson Reuters. That was up 40% since 2008. 98. "More than 50 million Americans couldn't afford to buy food at some point in 2011," writes CNNMoney, citing U.S. Department of Agriculture data. In June 2012, 46.7 million Americans received food stamps. 99. Japan's working-age population is on track to decline from 62.6% of its population in 2012 to just 49.1% by 2050. 100. The unemployment rate for those with a bachelor's degree is just 3.7% — less than half the nationwide average.